The flavors of this cookie are very reminiscent of many treats from our Scandinavia background and delicious enough to be dessert after a heavy holiday dinner or just a treat with coffee at anytime during the festivities. Mix together and set aside the flour, baking powder, and salt. In a large mixing bowl beat the butter until softened. Add the sugar and beat until fluffy. Add the egg and almond extract to the butter sugar mixture and then mix in the flour mixture from the first step. Divide dough into four equal parts and form each one into a 12 inch roll. Place two of the rolls 4-5 inches apart on a non-greased cookie sheet and flatten each dough roll so it is about 3 inches wide. Repeat with last two rolls. Brush with milk. Sprinkle with sliced almonds. Bake at 325° for 12 to 14 minutes. Edges should be slightly brown. Cut into 1 inch diagonal strips while the bars are still warm, but not hot. Cool and then drizzle with almond icing. Makes about 48 bars. 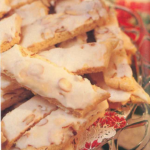 Stir together powdered sugar and almond extract and milk to make a thin consistency and drizzle over bars. The instructions indicate to blend in the sugar. However, there is no listing for sugar on the ingredients list. Sorry about that..the recipe requires 1 cup of sugar and 2 cups of flour. I think it has been corrected on the blog but if not, here is the whole list of ingredients. It is such a simple recipe and yet I messed it up. I don’t believe the corrected ingredients list above is for the Scandinavian almond bars? I don’t think there are chocolate chips in that recipe? You are right…there are no chocolate chips in that recipe. This is the recipe: Sorry for the confusion on the recipes in that post. 1 cup white granulated sugar and beat until fluffy. Add 1 egg and 1 teaspoon of almond extract to the butter and sugar mixture. Mix to combine. Combine with dry ingredients and mix until well blended. cookie sheet and flatten dough with your hands until it is about 3 inches wide. Repeat with the other two remaining rolls. Brush with milk. Sprinkle with sliced almonds. Bake at 325 degrees for 12-14 minutes. Edges should be slightly browned. Cut into 1-inch diagonal strips while bars are still warm. Cool and then drizzle with icing. Mix just enough milk or cream into sugar to make a spreadable icing. Add extract. Thin with more milk or cream to desired consistency.